It’s fun, there are no hidden messages and everything is so pure, so perfect and so absurd. Just brilliant, glorious artwork, a great imagination and top entertainment. 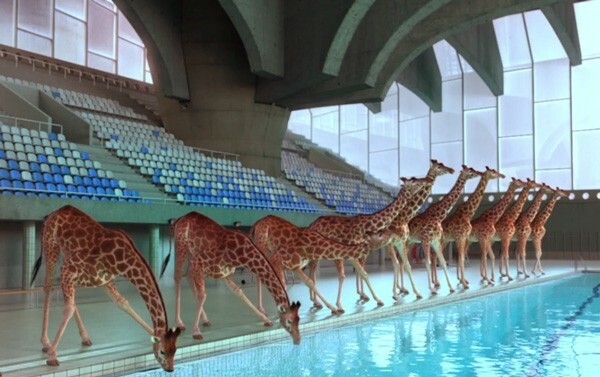 Paris-based Nicolas Deveaux at Cube Creative is responsible for this animated video called: ‘5m80′, a short film featuring high diving giraffes. Please do watch every second of this stunning video, which is both hilarious (giraffes performing diving bedazzeling, unexpected tricks) and touching. Because of the so-natural-it-seems-real movement of the giraffes, you almost believe in the impossible. A must see, I tell you. The Squid Stories ‚Image of the day’ thanks Fresh Gadgets.nl for spotting this ‚Image_slash video_ of the day’ story. Previous PostRichard Wilson Oil Installation/image of the day #14.